Diageo has unveiled a bold new Pan African campaign, #madeofblack, via a five hour take over on MTV Base. Over a year in development, #madeofblack, part of the global Guinness ‘Made of More’ platform, shines a light on a movement being created by a new generation of Africans whose boldness cannot be contained and who are fuelling a new, progressive spirit of Africa. A first for Guinness and MTV Base, the five-hour takeover featured #madeofblack stunts, guest appearances from Fuse ODG and Phyno amongst others, and the premier of the new Guiness #madeofblack commercial. The commercial, conceived by AMVBBDO London with BBDO offices in Africa, and directed by Sam Brown, features a powerful compilation of African performers, artists and creatives who are filmed expressing their own #madeofblack story and attitude in their own individual way. The #madeofblack campaign will continue to develop and build over the coming weeks. Fuse ODG, MOBO award winning artist, alongside the cast of the TV commercial and a wide variety of influencers and ambassadors will share their own #madeofblack stories via a busy social media Selfie programme, which will see well known faces asking consumers ‘What are you made of?’. 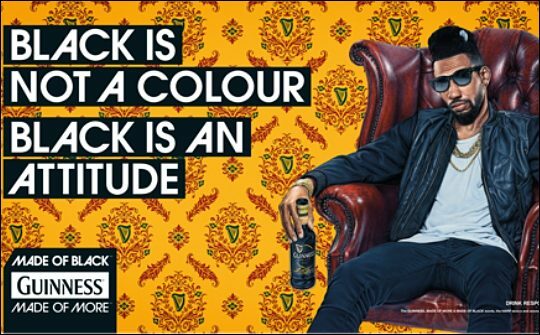 The new campaign follows the recent successful global launch of the new look Guinness Foreign Extra Stout bottle and will be supported by strategic digital, outdoor, radio and print advertising, which comprises a series of hand painted, impactful designs of key #madeofblack ambassadors sharing how they are #madeofblack. The digital, outdoor and print advertising was designed by Steve Caldwell and Dan Funderburgh.